Today (Dec 16th) is my Mom’s birthday. 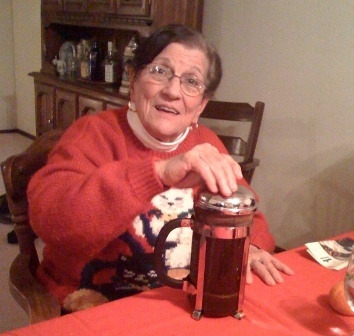 As you can see, we gave her the honor of plunging the French Press at her birthday dinner – she taught me everything I know (in many ways). She happens to be one of Tazza D’Oro’s biggest fans and a lot of the incredible pastries we sell are made by my Mom at the bakery. Rob, Marc and I are very grateful to have her in our lives – Happy Birthday, Mom. Ti amo! Happy Birthday, Mern! You look wonderful! Hope to see you over the holidays.